Understanding SVT from an integrative perspective…Yes, if you have SVT, you have an accessory pathway present, but why do you have electrical mis-fires on some days vs others? Why does SVT seem to occur more frequently when you are stressed, didn’t get enough sleep, are dehydrated or overate? Why do so many people with SVT also have POTS, anxiety, and adrenal fatigue along with their SVT? SVT may not be as “random” or isolated as you think. Below is some information to help you begin to understand SVT from a more integrative perspective and as a condition that is presenting from deeper levels of depletion, along with actions steps you can take right away to help yourself! My basic concepts about Healing SVT Naturally take what we know about SVT and add a deeper understanding of the root causes (that are not conventionally considered) that exacerbate SVT. I include the missing treatment options in the current way of viewing and treating SVT by addressing your diet, mindset, lifestyle and the underlying causes of the condition. Acute SVT can be precipitated by depletion and other common denominators like: Poor diet, digestive issues, carb heavy meals, constipation, sugar, hormone imbalance, stress, lack of quality sleep, unhealed emotional wounds, and more. Depletion from a nutritional perspective impacts your electrical system since we need vitamin and mineral balance for healthy heart rythm function. Sugary foods, and undiagnosed food allergies can set you up for a compromised gut, malabsorption of essential minerals, inflammation and more. My aim is to help educate you about SVT associated depletion and what to do about it. SVT is not like other health challenges. The nature of an SVT’s sudden and seemingly unpredictable on-set, as well as the current limited treatment options can make patients feel fearful, stuck and out of control. People’s first impulse is to hate their SVT and become desperately afraid of it. Before we can learn to effectively treat SVT using an integrative approach, we have to adopt new ways of perceiving SVT. If you believe that all health imbalances are a combination of Body, Mind, Spirit, then this condition is no different. I want to help you learn about the physical, energetic, emotional and spiritual aspects of this HEART chakra issue. SVT holds valuable learning experiences for us that can ultimately help us transform our lives and health in deep ways. If you feel overcome by SVT and related anxiety, hate your SVT and feel like it’s the worst thing to happen to you, it’s time to shift your thoughts, and implement a new mindset that helps you view SVT as your most important teacher so you can really begin to take on the true healing that is calling you Healing begins with changing your perception and opening up your awareness. Whether you were recently diagnosed with SVT, or have suffered with it for years, you likely feel concerned about your ability to manage your condition and find lasting healing and relief. If you are interested in a whole new approach to SVT that could not only free you from chronic episodes but also the restrictions and anxiety that come along with SVT, then you are in the right place! My Heal SVT Naturally THE BASICS e-guide will introduce youto my integrative approach to healing SVT naturally and elevating your entire health. It includes the missing treatment options in the current way of viewing and treating SVT by addressing your diet, mindset, lifestyle and the underlying causes of the condition. My journey with SVT has led me through traditional cardiology and alternative approaches. After years of learning to trust my instincts to try natural ways to feel better, I have found lasting relief from SVT and my related symptoms such as anxiety, panic attacks, digestive issues, adrenal fatigue, POTS, and migraines. I have transformed my life, health, SVT, and even my career as a result of the way I have chosen to deal with my SVT. Now I share my insights with thousands of other people around the world who feel restricted by the limited options of medication and ablation and who gravitate toward a more whole-body integrative approach to their SVT and entire health. My e-guides, are an expression of my experience and knowledge to date and my effort to help you quickly and easily learn what took me years of suffering and searching to learn and apply. I wrote two e-guides that explain these core strategies: Heal SVT Naturally THE BASICS, and THE SVT PREVENTION Diet. 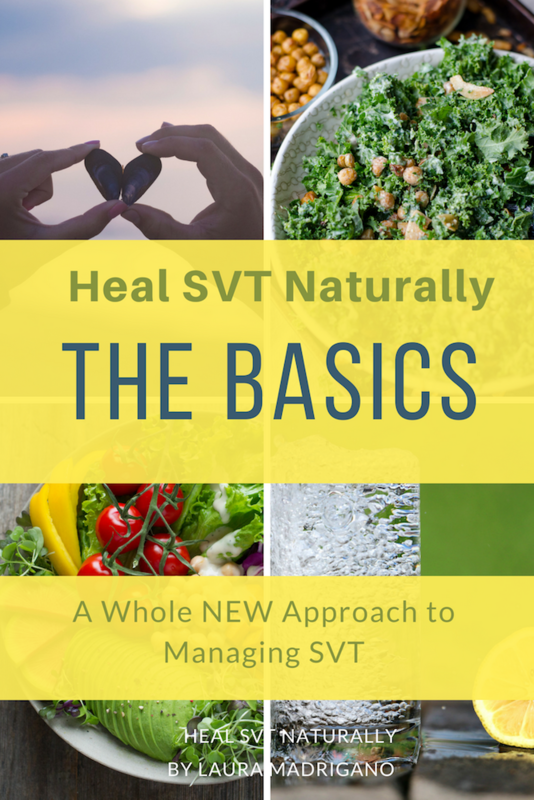 The Integrative Approach to Healing SVT Naturally. The missing and supplemental treatment options in traditional cardiology & how to apply lifestyle medicine to your healing plan. How to create a NEW SVT MINDSET: It’s time to empower yourself and learn how to mentally manage your SVT! Learn powerful ways to reframe SVT; not as something that is happening to you, but for you. Your SVT has a message for you! Learn how to find the deeper meaning behind why you have SVT. The differences between traditional cardiologyand why an integrative approach is a way to find more lasting full spectrum healing. Learn about ROOT CAUSE Medicine.Assess the underlying causesof your condition. Why you have SVT and what to do about it. Episode Empowerment:A mini guide within the guide to help you learn how to stay calm during episodes, how to engage the parasympathetic nervous system, and steps for the modified Valsalva maneuver and other conversion methods. SVT Triggers: Learn how to identify and mitigate your SVT Triggers. The CORE FOUR Healing Layers:The ROOT causes of SVT and how to take action in each of the highlighted healing areas. direction you can take within each healing layer to find relief. Everything is Interconnected: Integration and Prevention: How to process and apply all of the new views and actions steps into your life. Long-Term Prevention as a way of life for SVT management. Self-care is the new Health care. The Work of Being Well: your next steps in the journey and other resources to support you. Learn about the SVT-GUT Connection and how to reverse malabsorption and depletion. Identify which foods will improve digestion and reduce inflammation. 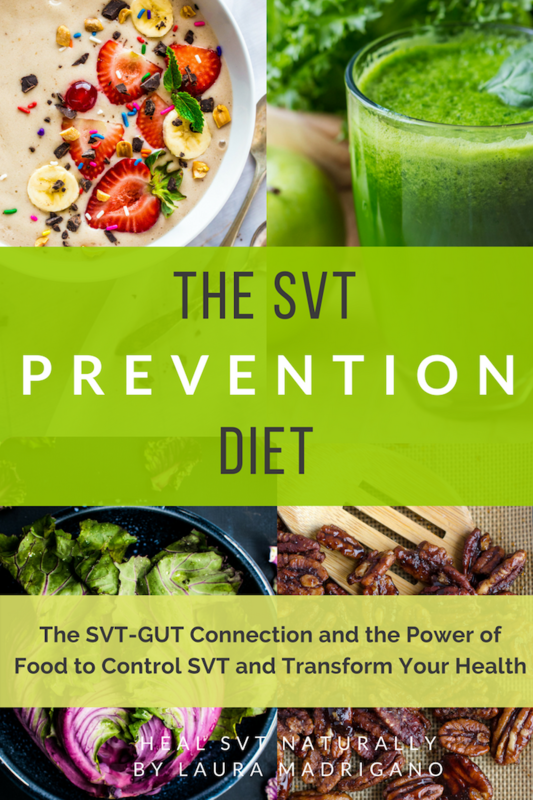 Give you all the SVT Prevention Diet details and provide a diet roadmap to optimize absorption essential nutrients and minerals that are necessary for healthy heart rhythm function and SVT prevention. Advise on food sensitivity lab testing so that you can have proof and incentive to commit to eliminating such foods in order to heal your gut and your entire body. Show you how to decrease SVT-related fear and anxiety using nutrition. Identify supplements and super foods that will support your SVT management. Link nutrition to your SVT co-symptoms including SVT-POTS and anxiety. Explain supportive tactics such as intention setting, vision boarding, and journaling to help you in your transformative efforts. I wish someone gave me this e-guide was I was sick, scared and suffering. I wrote a basic e-guide to help people gain a full spectrum overview of SVT from an integrative perspective, and what to do about it from a physical, emotional, spiritual and energetic perspective. Sign up for exclusive emails, from me with all the latest information and inspiration on healing SVT naturally.